Pumpkin is a popular fruit-bearing species of flowering plants that is known by the scientific name Cucurbita mixta. It grows as a crawling vine across the ground and produces a large, orange fruit that is very healthy. It is perhaps best known in the United States as a decoration for Halloween. 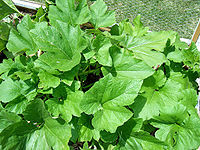 The pumpkin plant is a green vine that crawls across the ground. It has many large, prickly leaves. The plant produces both male and female blossoms, which do not stay open for very long. Once the blossoms are fertilized, they begin to produce the fruit, a large gourd called a pumpkin. The pumpkin is attached to the plant by a thick, brownish-green stem that provides the water and nutrients necessary for the pumpkin to grow. Small tendrils sometime grow on the stem. These help anchor the vine and make sure that it is not damaged by the wind or other factors. The pumpkin itself is a large, round gourd. 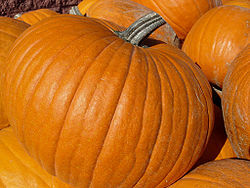 The outside rind of the pumpkin is usually orange, although it can be white or yellow as well. Indented ridges that run from the stem to the base can be found all around the surface of the pumpkin. 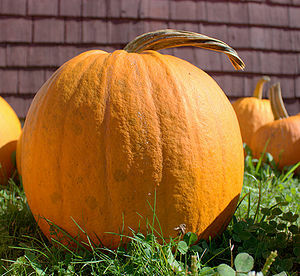 The size of the full grown pumpkin will depend on what type of pumpkin is being grown. Some types will grow to be no heavier than a pound. Others can grow up to over five hundred pounds, but the average weight of a pumpkin is between ten and twenty pounds. On the bottom of every pumpkin lies a grey colored scar. This is the place where the fertilized flower was, and after the flower had produced the pumpkin and fallen off, the scar was left behind. Inside the pumpkin is a large cavity. This space holds a large mass of gooey, fibrous strands. These strands are what the seeds grow from, and they provide all of the materials necessary for the seeds to grow. The seeds are oval in shape and white in color and are quite large. The light orange, slightly hard coating on the inside of the pumpkin is called the pulp. This acts as a second coating inside the rind that helps protect the inside of the pumpkin. Besides the fibrous strands and seeds, the inside of the pumpkin is completely empty. The pumpkin plant is monoecious, meaning that one plant has both male and female blossoms. When the plant is ready to reproduce in the spring, the male blossom begins to produce pollen. This pollen is carried to the female blossoms either by the wind or by animals such as bees and birds. When the pollen unites with the egg in the female blossom, a zygote forms, and the fruit begins to grow. A hard shell also forms around the new seed to protect it while the fruit matures. Fertilization usually occurs in May, and the fruit grows until near the end of August. The plant needs lots of water during this time, as 90% of the pumpkin fruit is made up of water. After about one hundred days, the orange rind around the fruit will harden, and the fruit will become mature. When winter comes, the plant will die due to the cold weather and the fruit will stop growing. The fruit will then start to decompose because of cold weather and animals eating the fruit. Eventually, the rind will completely decompose and the seeds will be exposed to air. Inside of each one of the seeds is the necessary genetic information for another plant to be grown. The hard shell of the seed will protect it from the cold weather, and when it begins to get warmer, the seed will germinate. The nutrients leftover from the decomposed pumpkin will also help the seed grow and get the materials that it needs to be healthy. The seed will continue to grow, and eventually make blossoms, starting the process over again. Pumpkins are an extremely popular fruit to grow, as their pulp and seeds are delectable and they can be a pleasant-looking decoration. Because of their popularity, over 1.5 billion pounds of pumpkins are grown every year in the United States. Eighty percent of the annual pumpkin crop is available in October due to their common use as decoration during Halloween. Pumpkins are a warm weather crop, so they are usually planted in May or June. They can also be planted in July, but many farmers consider this too late to plant pumpkins. This planting in the early warm months provides an excellent growing season for the pumpkins, as well as makes sure that the pumpkins are ready for October when many of them will be sold. Pumpkins originally came from Central America, but have been brought over to many other countries, and now are grown in every continent except for Antarctica. They can even been grown in extremely cold places such as Alaska. They are also very hardy plants, so if part of the vine is ripped apart by wind or animals, then that part can grow back quickly. Many creatures can be harmful to pumpkins while they are growing. Insects such as beetles, aphids, and worms eat parts of the plant and can hurt it and give it diseases. Luckily, these pests can easily be controlled with pesticides. Although these animals can be harmful to the pumpkin, others can be helpful to it. As animals devour the pumpkin fruit, they also ingest the seeds. The seed cannot be digested by the animal, so when the animal excretes the seed elsewhere, the seed is spread and the pumpkin can spread its seeds to a new area through this. Many parts of the pumpkin are used for cooking purposes as they are both edible and nutritious. The pulp on the inside of the pumpkin has a delectable flavor, and is very high in potassium and vitamin A. This makes it popular in baking, especially as a filling for pies or as an ingredient in other baked goods. The pulp can also be dried and eaten like a potato chip. The seeds are high in iron, and are commonly roasted and eaten as a snack. Since the rind and fibrous strands do not taste very good, these are usually put into animal feed because they are high in fiber and vitamins. The blossoms are also edible, but they are not eaten very often. During the Halloween season, pumpkins are commonly used as decorations for houses. People will cut the top off of a pumpkin and remove all of the seeds and fibrous strands. They will then carve faces or shapes into the face of the pumpkin and place a candle inside the now-hollow cavity. At night, the light will shine through the carved-out holes and make the picture on the face of the pumpkin easy to see. Pumpkin carving was originally done to ward off evil spirits during Halloween, but now most people only do this for fun and decoration. However, there are those that carve pumpkins competitively. Many contests are held every year, and many people will spend hours carving an intricate design onto a pumpkin hoping to win the contest. Contests are not only held for the best design, they are also held for the biggest pumpkin. Places such as county fairs usually hold contests that give awards to the largest crop grown, and since pumpkins can grow to monstrous sizes, they are a common contestant in these competitions. Normally, pumpkins will only grow to be about twenty pounds, but there are pumpkin seeds available that can produce pumpkins that could grow to be bigger than a human. Through a process called selective breeding, some pumpkin seed sellers will breed very large pumpkins with other large pumpkins, and their seeds will have the genetic information for a very large pumpkin as well. The seed alone will not produce a large pumpkin, though. The seed needs to be planted earlier to ensure a long growing period for the fruit, and so it will need to be in a warmer climate where the weather will start to get warmer earlier in the year. It will also need many nutrients, so fertilizer will be necessary. The plant will need enough sun and a large amount of water as well, since the pumpkin fruit consists mainly of water. If all these conditions are met, then the pumpkin fruit will likely grow to be very big.. The world record for the largest pumpkin ever grown is 1,140 pounds. This page was last modified on 22 May 2011, at 21:02.